Ready to make an impact on your diet and fitness, dive now. Exercise in water, such as aqua aerobics are taking it to the next level. Don't be the only one not making the same transformation. You can. See how! There is no mistake in saying that swimming is an aerobic exercise that is good for you body. Despite being preached over the benefits of swimming, there are still people staying, "There are reasons why I don't swim." What to wear when you hit the pool may be why. The numbers of people who feel, "If I could just lose a little more weight, then I might consider swimming," are not few. No matter what's keeping you out of the pool, reconsidering is a must. Swimming is good for your entire body. Not only does it help you burn of fat safely, the health and beauty benefits you can expect to get out of it is worth it. Compared to conventional exercise, swimming helps you train inner-muscles that exercise out of the pool fail at doing. So, don't be shy. Give swimming a try and be ready to start seeing results. Enough about swimming for one day (save for later) let's just focus on being in the water. You would be surprise on what you would find out. Swimming is exercise performed while immersed in water. There are many benefits to exercise in water that you can't get out of convention exercise. Swimming has many characteristics such as buoyancy, water pressure, water temperature, and resistant all property inadherent to exercise out of the water. This property is what makes similar exercises yield differently, showing at least twice better results for exercise done under water, requiring less effort on your part. For those of us less adapt to routine exercise such as walking, it is easy to overdo things and end up hurting your knees or lower back. Even if you manage to support you weight just fine, you eventually have to give into the pain in your joints. Exercising in water reduces burden on your joints through buoyancy. This is why it is often recommended to those undergoing rehabilitation suffering joint problems. This allows you to move freely without worrying about hurting yourself, allowing more variation in the types of exercise that you can do. As water applies constant pressure against your skin through your entire body, blood circulation improves, making burning off fat easier. This combined with exercise (increased activity) makes it possible to burn of more fat than possible out of water. In addition, by having water push against you body in all directions, it is possible to train muscles throughout your body. The human body tends to stay at fixed constant temperature under healthy conditions. It takes a considerable amount of energy to do this, burning energy to restore heat to your body. The amount of energy your body uses in the water is considerably more than that out of the water, as pool water temperature is lower than that of your body. Comparing swimming to conventional exercise in terms of energy expenditures yields no contest. Just by sitting and walking around in a pool is it possible to burn off more energy than most conventional exercises. Moving in water requires you to overcome resistance. Over time this resistance can be tiring and alone can constitute a workout. Comparing this to the amount of resistance you get while walking around the track, there is no comparison. Movements done in water are more effective at training your muscles. This combined with the load water pressure puts on your body, gives the muscles deep side your body (inner-muscles) much needed stimulation. Getting the same effect out off conventional exercise is difficult. Swimming gives you all of these benefits without even thinking about it. 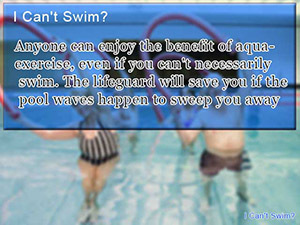 Can't swim? No problem. Who said you had to swim to get into the pool. Go on jump right in. There are other ways to exercise in the water besides swimming. The exercises that use to be exclusive to people under rehabilitation may be at your nearest YMCA. Exercises such as water walking, water jogging, and aqua aerobics have taking people who aren't able to swim into the pool, bringing to them the many benefits that in-water exercise has to offer. As you might have guessed, it just walking or jogging, in water. As simple as it may sound, you get all of the benefits of swimming along with no burden on your joints associated with out of water light exercise. However, because of water pressure, resistance and possibly water flow associated with being in the pool, activities as simple as walking or jogging can prove difficult. For this reason, it might be necessary to hug the wall until you get use to it. Everybody's got to start somewhere. Don't let training wheels stop you from getting around in the pool. You may not be a stranger to aqua aerobics (also known as water aerobics). Like the name implies, its aerobic exercise in the water. Moving along with music, following the direction of you instructor, seeing others have as much fun as you are having is what makes it so attractive to anyone just looking to get more active or meet new people. Although aerobics likes to take it up a notch, in aqua-aerobics you don't have to, using the water to your advantage, providing a soft balance between getting the best workout of your life and having fun doing it, working your whole body. Even for someone who has lost their two-step, aqua aerobics is quite rhythmic, giving it a quick learning curve. Don't be fooled by how easy it is; it gets results. Is it true that swimming does not help you gain weight? Among use there are people asking if swimming helps you lose weight or not. In fact, just getting started out, it is not uncommon to gain weight temporarily. The reason why this happens is as you swim you put on muscle mass, which is heavy than fat. This may cause you to gain weight, but not necessarily mean you are getting fat. A wise man of fitness would tell you, "Losing fat is more important than losing weight." The two are often though of as hand in hand, leading to confusion. Back to swimming, by putting on muscle mass, you increase your metabolism, making you body more efficient at burning of excess fat. This is what makes swimming one of the best exercises for your diet and fitness. 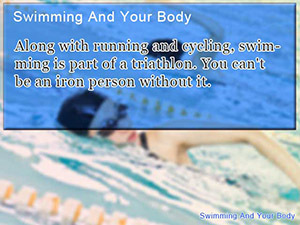 Along with running and cycling, swimming is part of a triathlon. You can't be an iron person without it. There is a lot to take from exercising in the water, not just cooling off on a hot summer day. 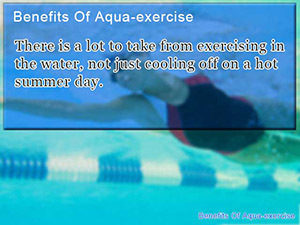 Anyone can enjoy the benefit of aqua-exercise, even if you can't necessarily swim. The lifeguard will save you if the pool waves happen to sweep you away.